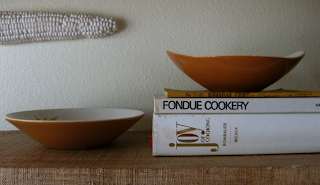 It's a bit hard finding great vintage pieces here on Maui that are not too kitschy. We have a few places we like to browse from time to time as well as craigslist. Last week we managed to come up with a few really good finds. Some for the new office, some for the kitchen. 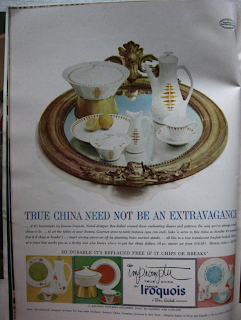 Last winter John was looking through a vintage copy of House Beautiful from October 1960 and saw this ad. 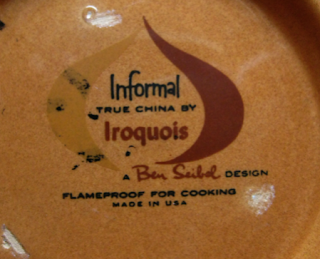 He commented on it and we wondered why we did not have any of this china. When all of a sudden we got the long dish pictured below from a friend for Christmas. The exact pattern in the ad. How random is that? Then last week we walked into one of our favorite little shops (I'm keeping it a secret) when John spotted these 2 little beauties. 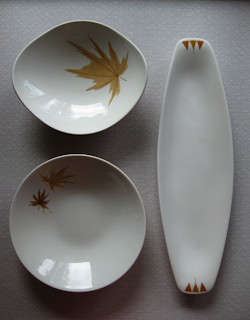 The leaf patterns are cute, but we really flipped over the shapes of the bowls. Price: $1 for both. 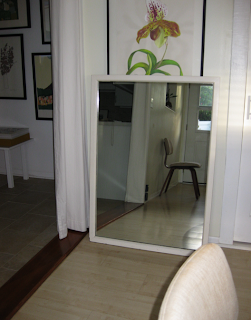 We had also been looking in all the hot spots here for a BIG mirror in a simple white frame. We had seen a few that were $100 or more and they were just ok. In the same shop that we found the dishes, we came across this in the 50% off section. It's 43" x 30" with brown frame that had been painted white... in need of a makeover. But a really easy one. At $20 it was PERFECT! 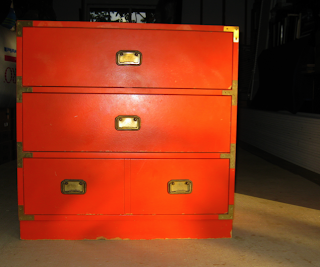 Our plan is to strip it as some of the paint has peeled off and either re-paint it white or maybe a gold/brass metallic color as we plan on hanging it right above the orange chest pictured below. We found this little beauty on craigslist. 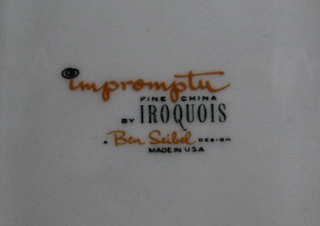 A vintage 70's piece... not really made all that well or in great shape... BUT HELLO...IT'S ORANGE! It's 30"x 30' x 18"and it too needs a bit of a birthday. It also smells like an old grannies house... lot's of perfume had been sprayed into it over the years so we are airing it out. All the drawers are out and filled with wadded up newspaper to absorb the rosewater or whatever it is. And it's working quite well. We may even be able to use this piece as a pattern to make a new one if we cannot get the stink out altogether. 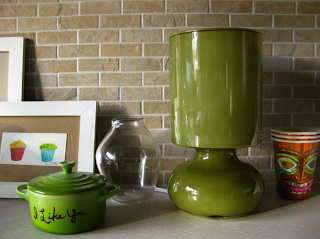 And lastly, we picked this up at the same shop as the dishes and mirror. Although it is NOT vintage it will fit in perfectly with all our pieces. It's actually from IKEA. We don't have IKEA here and cannot even get it shipped over. Luckily we paid less than sticker price... $10. I think it will be perfect on the chest under the mirror. Ok now that we have "that" corner of the room done... next? 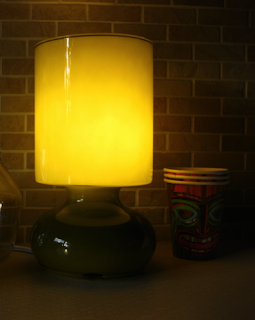 wow - green lamp lights up yellow?? is the chest and mirror going in the studio? ?